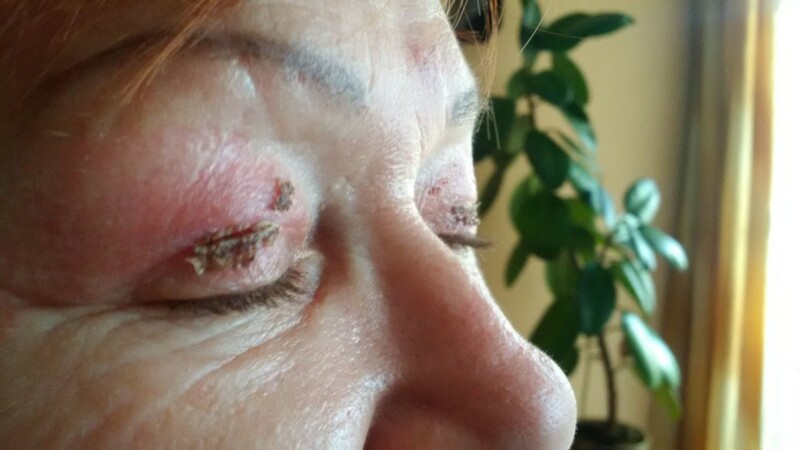 Long-Term Healing after Plasma Upper Eyelid Lift High-Intensity Treatments. While the short-term healing results in swelling and the scabbing, the long-term healing deals with the long-term regeneration and remodelling of the skin. While the former takes place immediately after the treatment and it is over within a few days, the latter usually takes place over the course of weeks, and sometimes even months. During the long-term healing, the skin is still subject to redness, tenderness and it is still being remodelled. The remodelling lasts as long as the tenderness is still occurring. The intensity of the treatment (remember that the treatment intensity is dependant on a number of factors, and not only the power setting of the device). In particular the longer the duration of the arc the deeper the heat will be propagated inside the skin. The closer together the spots the more intense the heat. 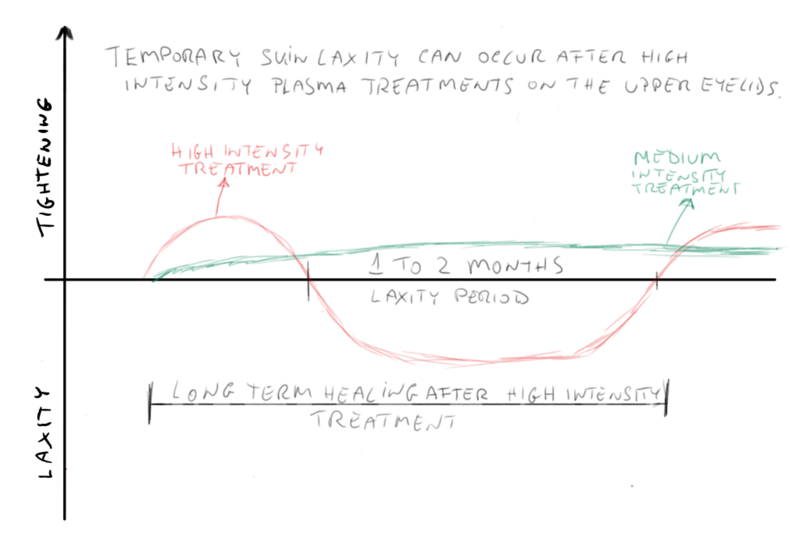 Generally, the higher the intensity of the treatment the more intense is the redness after the procedure and the longer it takes for the long-term healing to be over. The duration of the long-term healing is also dependant on the individual skin recovery ability. Certain appropriate soothing or healing products can reduce the time required for the long-term healing process. WHAT IS THE LONG-TERM HEALING PROCESS ANYWAY? While the short-term healing process can be easily explained by comparing it to the effects of skin burns and small injuries, the long-term healing process has to refer to something slightly different. We relate the long-term healing process to the all familiar topic of skin regeneration after mole removal or minor skin wounds recovery process soon after the scabs have fallen off. After the scabs have fallen off following plasma aesthetic treatments or minor skin injuries, the new skin is usually red and has a different texture to the rest of the skin. The area can also be itchy and tender for a while. Also, the long-term skin recovery process is similar to that which occurs after deep skin cosmetic peels. Like in skin peels the deeper the peel penetration the longer the redness after the treatment, however generally the long-term skin recovery period after plasma treatments take longer. While a peel long-term recovery can last up to three weeks (with a feeling of tenderness and dryness of the skin) the redness and tenderness and dryness can last up to 3 months, this is normal and to be expected after plasma high-intensity treatments. While the skin is still red and tender it is still being regenerated and remodelled. In order to understand what it is happening during the long-term healing, we will take the mole removal example. When the new skin regenerates it is of a different red/pink colour and it lacks pigmentation. Also, the texture is different. Area a few days after plasma mole removal. The area is red soon after the scab has fallen off. The new skin will eventually return to normal colour and texture consequently blending with the surrounding skin. Over time the skin texture and colour will return to normal and it will be difficult to tell any treatment was carried out at all. After mole removal, the scabbing takes place. Once the scab has fallen off the area will be red and have a noticeably different skin texture than the surrounding skin. This is because the new skin has formed instead of the old skin lesion. When the new skin forms it is usually a vivid colour and it also has a noticeably different skin texture. 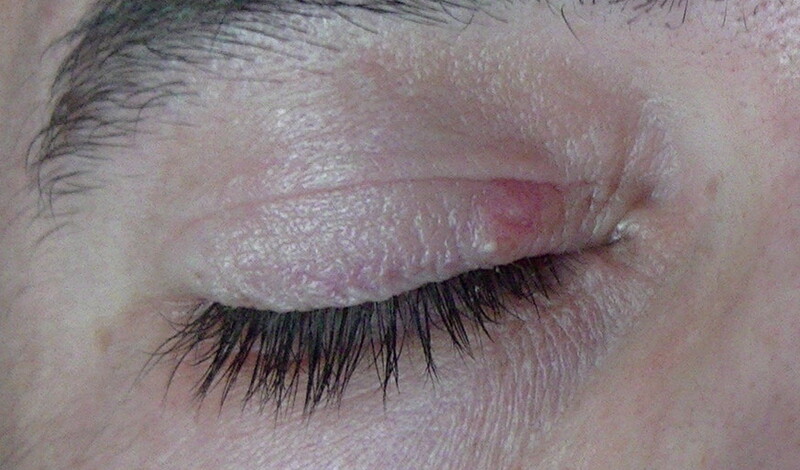 Detail or the right eyelid a few days after a benign skin lesion removal procedure using electrical plasma. The area is red/pink after the scab has fallen off. The difference in colour between the treated area and the surrounding skin will slowly fade away over the following weeks. Similarly, the new skin texture will blend with the surrounding skin over the course of the following weeks. the heat stimulation caused by the treatment. 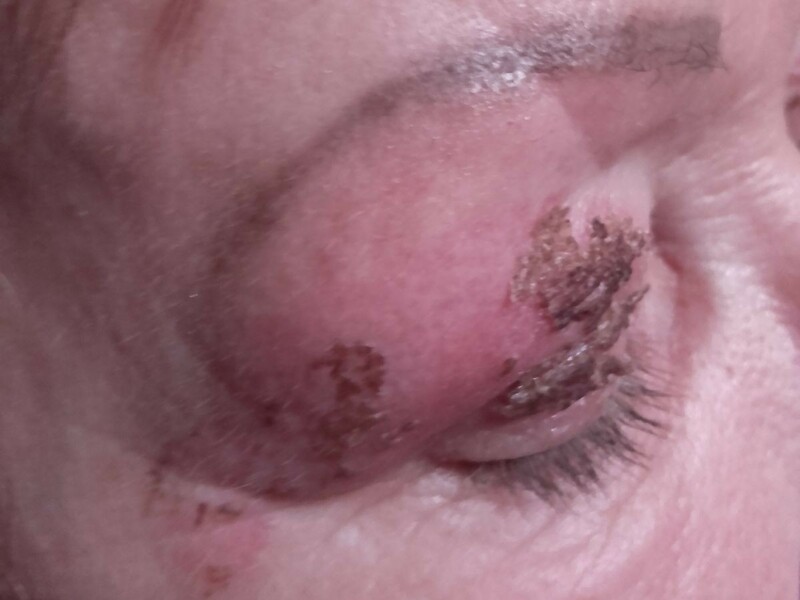 This picture shows the scabs falling off after an intense plasma upper eyelid lift procedure. 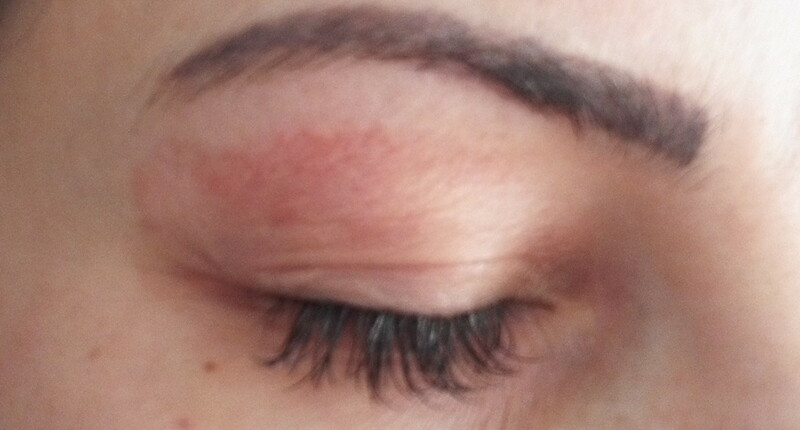 Some of the scabs are still present and this picture shows clearly how as the scabs fall off, the area is noticeably red from the plasma eyelid lift procedure. After the short-term healing, the new skin is naturally red, furthermore, the skin undergoes a further continuous slow process of regeneration and remodelling during the time it takes for the area to recover from the thermal stimulation (burn) caused by the plasma superficial skin burn. In other words, inflammation, redness and skin remodelling are an "all in one" effect of the long-term skin healing process. "Red Meat" colour after the scabs have just fallen off. 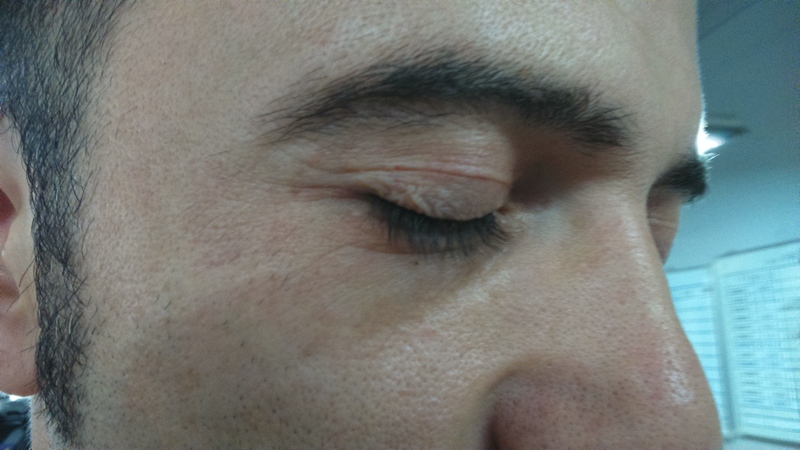 This is a normal occurrence after plasma localised skin tightening. Since the redness is due to the skin regeneration process, exposure to intense UV light, during the long-term healing can lead to hyper-pigmentation. As a rule of thumb, when the redness is completely over, then direct sun exposure is less likely to lead to hyperpigmentation. Furthermore, if the treatment is repeated before the long-term healing is completely over (while the area is still tender), the treatment becomes unbearably painful even using most common "over the counter" topical numbing products. Therefore as a rule of thumb, if the area is still red or tender, the treatment should not repeat until the area has returned to normal and the tenderness faded completely. Please note that the end of the redness does not mark the end of the long-term healing. The area may still be still subject to the long-term healing even while not appearing red at all. What marks the end of the long-term healing is the end of the tenderness instead. In any case, the redness is not permanent and it subsides over time. Tenderness and redness should not be cause for concern, because it is a normal part of the long-term recovery process. It will eventually subside on its own accord without leaving a trace as long as no exposure to intense UV light has taken place. The picture was taken one month after the plasma high-intensity treatment. Redness and tenderness of the area and slight laxity after a plasma high-intensity treatment. Itchiness. The initial feeling is of itchiness, which starts during the scabbing process and continues soon after the scabs have fallen off. It usually lasts approximately 7 to 10 days after the scabs have fallen off. Tenderness. While the itchy feeling subsides slowly, it is replaced by a feeling of tenderness. The degree of tenderness and its duration is dependant on the treatment intensity. The end of the long-term healing process is marked by the end of the feeling of tenderness. Dryness. This feeling can occur as soon as the scabs have fallen off and it can last all throughout the long-term healing period. A stinging feeling is also common all throughout the long-term healing when applying creams, sunscreen and cosmetics. Even low-intensity treatments do cause similar reactions, however, the symptoms last less and their intensity is far milder. Please note that the redness can still have subsided while the healing process is still ongoing what really marks the end of the long-term healing process is the end of the tenderness. An important aspect of the long-term healing process is the skin re-modelling. There is usually a clear change in the skin structure immediately after the scabs have fallen off. However the change at that point is evident but not permanent, the skin structure will change over the course of the long-term healing while the skin feels still tender. The following pictures are a demonstration of the re-modelling happening over the course of a few hours after the scabs have fallen off. The day after the scabs have fallen off completely the area is significantly red. Some results may be apparent already in most cases, however, the area is still subject to change over the following hours and days. After the scabs have fallen off (during the long-term healing) the change becomes significant and relatively rapid. In the picture below you can see the difference (in terms of tightening) a few hours later. However, the area is still red. 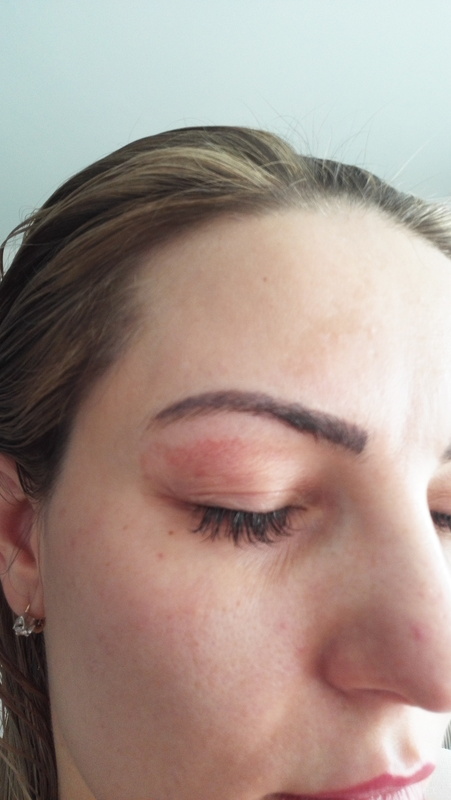 A few days after the scabs fell off after plasma eyelid lift treatment using the spray operation. The area is still red and still subject to remodelling. The area has tightened further compared to the picture taken immediately after the scabs had fallen off. The area will be still subject to change over the course of the long-term healing. Once the tenderness is over the results can be regarded as virtually permanent. 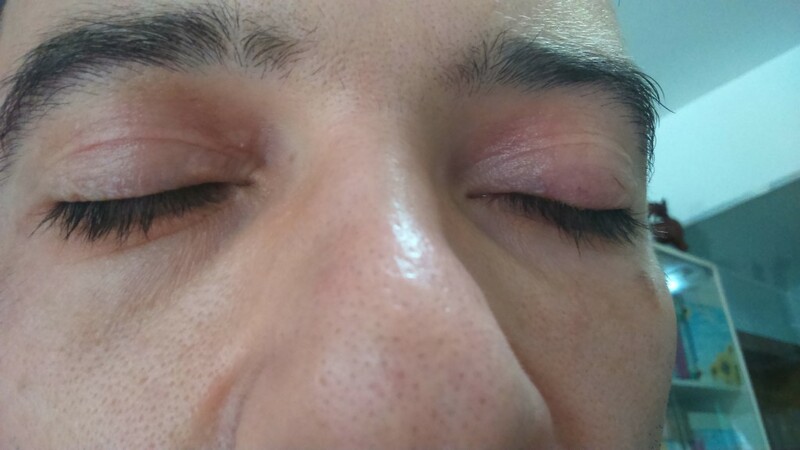 Eyelids over one year after the last plasma upper eyelid lift procedure November 2016. This is the long-term result of the plasma procedure. Please bear in mind that the skin is a live organ and subject to change over the long-term, therefore, however, slow the skin will change over the long period even after the long-term healing process is over. Once the desired results are achieved, the treatment can be repeated when required, usually several years later. Skin laxity is a temporary adverse reaction to the plasma eyelid tightening treatment. Please note that in all cases examined skin laxity has been a transient effect only observed during the long-term healing process while the area was still very tender. This transient effect has been observed only after high-intensity treatments. If skin laxity occurs, it starts to take place a few days after the scabs have fallen off on their own accord. In any case, even if the laxity is taking place the skin tightening will still occur in the long-term. Skin laxity has subsided in all cases observed. The skin laxity subsides over time as the long-term tightening takes place. 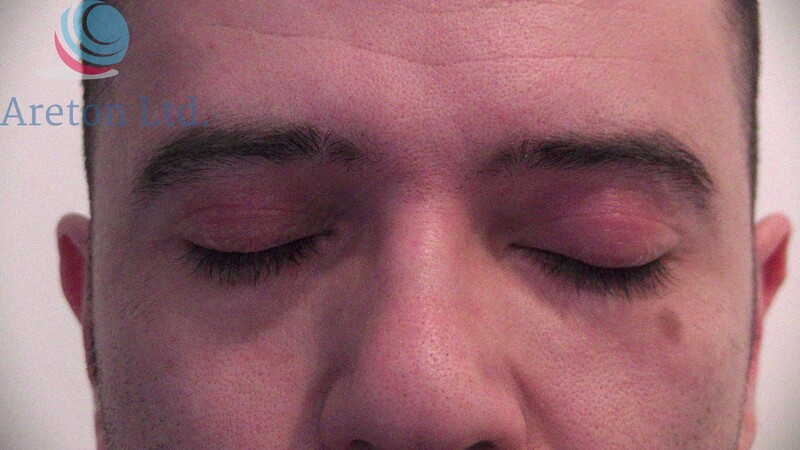 Whenever observed, skin laxity has subsided within three months after the plasma upper eyelid lift treatment. Please note that the skin laxity may not take place in most cases of low/medium intensity plasma treatments. 14/01/2017 laxity reducing over time. Tightening taking place during the long-term healing. it is advisable to carry out low/medium intensity treatments instead. 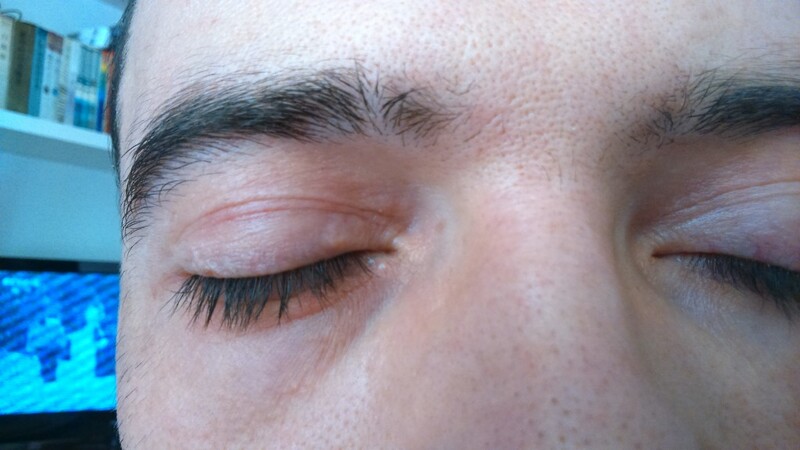 If the plasma eyelid rejuvenation treatment is carried out at low medium intensity, the minor improvements may be achieved without the need of going through extended periods of inflammation which can discourage people from undergoing further treatments. Therefore even if you are an experienced practitioner in these types of procedures this is a further reason for always opting for a medium intensity treatment. In all cases observed the redness and tenderness always subsided, hence these symptoms are all transient. To date, no case of chronic tenderness or redness has been reported despite the several thousands of high-intensity treatments performed the world over. Additionally, in case of high-intensity treatments, the temporary laxity is not a cause for concern as it is also transient. The skin remodelling lasts as long as the area is still tender (long-term healing). Once the tenderness subsides the skin remodelling is over. This is when the results become representative. Also, another problem reported is the presence of small atrophic red spots (sometimes lasting a number of months) where the voltaic plasma was applied. They are most likely caused by the use of makeup during the short-term healing process. All the effects discussed here are transient, however, hyperpigmentation is the only undesired effect which may become permanent, despite that, it can be easily removed by using certain other aesthetic products. Please note that individual results may vary. The skin reactions are also dependant on the individual.